Since debuting earlier this year, Legion has been praised by many as a unique, and primarily standalone, entry into the live-action X-Men canon. But according to showrunner Noah Hawley, there might be a way to bring one iconic X-Men character into the fold - in an entirely new way. During the show's San Diego Comic-Con panel, which you can read our liveblog of here, Hawley was asked which portrayal of Professor Charles Xavier - Patrick Stewart or James McAvoy - would he ideally like to have appear on the show. And according to Hawley, either option - or perhaps, an entirely new choice - could become a reality. "I don’t know yet what that would be," Hawley revealed. "On some level it would depend on who would do it. When we reach that part of the story — is it funnier if it’s the older one or the younger one? I don’t know. It’d be great if [David Haller] were older than [his] dad." "A Back to the Future kind of thing," added Dan Stevens, who plays Haller on the series. As Legion fans might already know, this isn't the first time that the possibility of an established Professor X appearing on the show has been entertained. Stevens recently revealed that he has already asked Stewart - who essentially wrapped up his portrayal of the character in this year's Logan - to appear in some capacity. Fans of the show will just have to wait and see which portrayal of Professor X does make its way to Legion. You can find the synopsis for Legion below. Legion is the story of a troubled young man who may be more than human. It introduces the story of David Haller, who since he was a teenager, has struggled with mental illness. Diagnosed as schizophrenic, David has been in and out of psychiatric hospitals for years. But after a strange encounter with a fellow patient, he’s confronted with the possibility that the voices he hears and the visions he sees might be real. Dan Stevens (Downton Abbey), Rachel Keller (Fargo), Jean Smart (Fargo), Aubrey Plaza (Parks and Recreation), Jeremie Harris (A Walk Among the Tombstones), Amber Midthunder (Hell or High Water), Katie Aselton (The League) and Bill Irwin (Interstellar) star in Legion. Noah Hawley (Fargo) serves as an Executive Producer along with Lauren Shuler Donner (X-Men: Days of Future Past, Deadpool), Bryan Singer (X-Men: Apocalypse, Superman Returns), Simon Kinberg (X-Men: Days of Future Past, The Martian), Jeph Loeb (Marvel’s Agents of S.H.I.E.L.D., Marvel’s Daredevil, Marvel’s Jessica Jones), Jim Chory (Marvel’s Agents of S.H.I.E.L.D., Marvel’s Daredevil, Marvel’s Jessica Jones) and John Cameron (Fargo, The Big Lebowski). 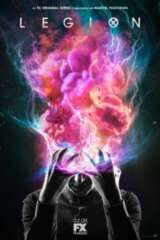 Legion is the latest project from Hawley and Cameron, two of the Executive Producers of the Emmy and Golden Globe -winning FX limited series Fargo.